The trimester that seems to take the longest is the third trimester. Many times, especially if you are overdue, the wait and weight become quite burdensome. Fortunately, acupressure is believed to be a great tool for inducing labor when the cervix is ready. 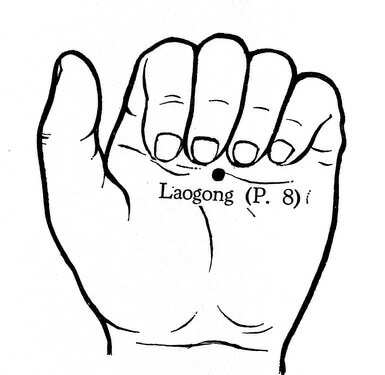 A pressure point is a focus point during acupressure because it is believed that these are the points where your body is storing and blocking excess energy from passing. It is important to remember that you will only be able to use pressure points if your body is ready. This is the most common place to start when trying to induce labor. 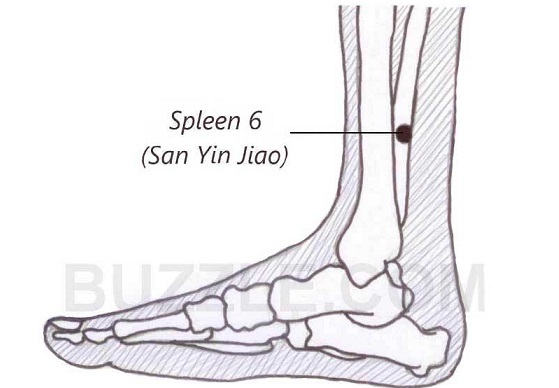 You will find it located about 4 cm above your ankle bone on the backside of your shinbone. Instructions: When you find the location, firmly apply pressure with your index finger. Hold the pressure for 3 seconds, stop for 1 minute, then repeat until you begin to feel the labor start. The pericardium 8 point is another one of the common pressure points to induce labor. This point is located in the middle of your palm, between the second and third metacarpal bone, you can find it by bending your middle finger until it lands on your palm. Instructions: Once you have located the position, lightly apply pressure with the thumb of your other hand and massage for several seconds. 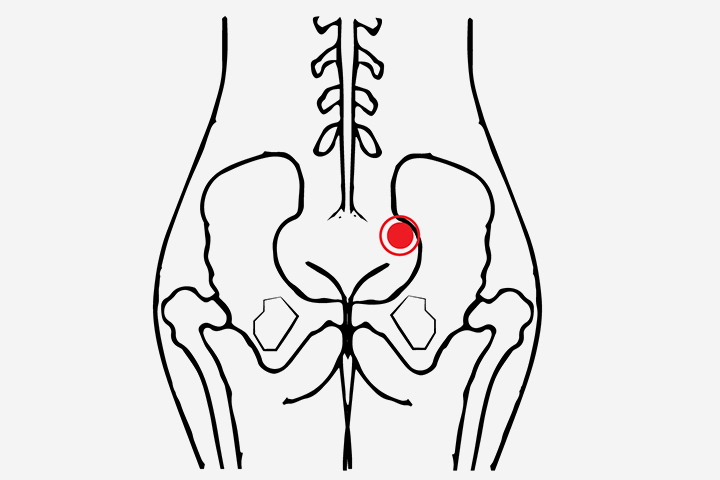 This pressure point is actually situated at the buttocks, within the dimple. Instructions: Firmly apply pressure and massage vertically for a few minutes. This pressure point will also help relieve any gynecological problems and infections as well as induce labor. You can solve many labor related pains with Bladder 67 Point. 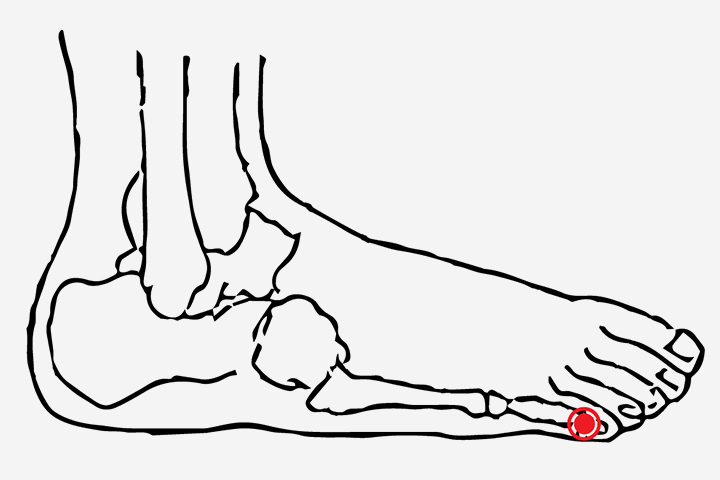 This pressure point is actually located in the little toe, also called the Pinky toe. Its exact location is on the outside edge along the nail. Instructions: Apply firm pressure using your index finger and thumb as a slight pinch. Remember that if you feel pain in your toe, you are pinching too hard. This process will actually help lower the baby into the birthing canal. The Large Intestine 4 Point is not only one of the pressure points to induce labor, but it is also extremely common for reducing many other aches and pains. 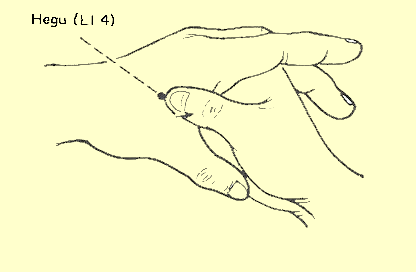 This point is located in the soft tissue between the thumb and index finger. Instructions: Hold this point between your thumb and first three fingers of your other hand, with your thumb on the top of the point. Gently apply pressure with your thumb and massage for 30 seconds to one minute. One of the best points for relaxing the mind and relieving it from anxiety during labor is the Kidney 1 Point. 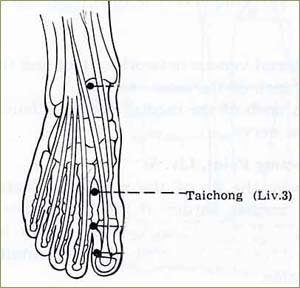 You can find this point in the sole of foot; it is located in the middle of the upper side of the sole of the foot. Instructions: Firmly apply pressure using your thumb. Applying pressure to this point will also help relieve over thinking, insomnia, and other health problems. This is a great pressure point to use when you need to relax your shoulders during labor. 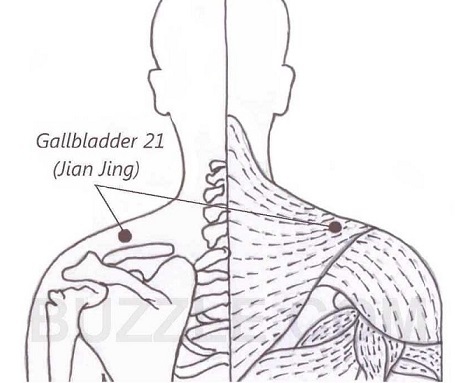 Gallbladder 21 Point is located at the peak of your shoulder, slightly away from your neck. This point is located on both shoulders. Instructions: Gently applying pressure and massaging over this site will help to relax labor pain as well as to relieve tension and headaches. One way to alleviate lower back pains is by applying pressure to the Liver 3 Point. 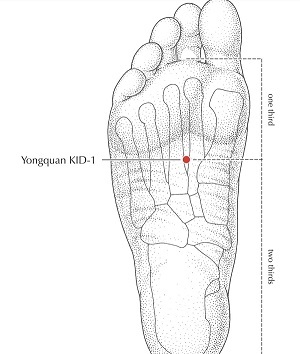 You can find this point on the top of both feet, located between the big toe and second toe. It's approximately 2-3 cm down from the top of skin between the two toes. Instructions: Use your thumbs to apply pressure during labor to relieve lower back pain. You may also find that applying pressure here helps with menstrual cramps and insomnia as well. The Bladder 60 Point will aid in easing labor pain as well as the birthing process. 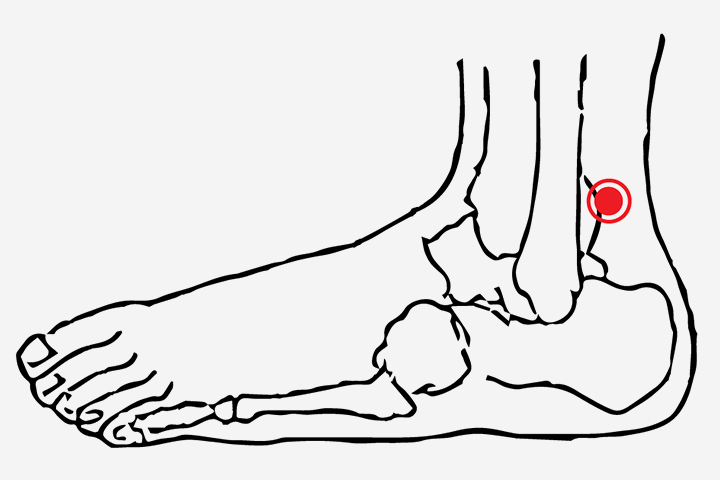 It is located on your ankle between the ankle and Achilles muscle. Instructions: Using light pressure, massage this point using your thumb for several minutes. This will also help with ankle swelling, dizziness, and back pain as well as reduce obstructions during the birthing process. You will discover that pressure points are extremely sensitive and when you touch one on a pregnant woman they react as if you have touched a bruise. When you are searching for the location, apply gentle pressure several times around the area until you find the exact location. If you are a labor partner or doula, you can use the mother's response as a guide. They will let you know when you have reached the location and when you are applying too much pressure. Although the pressure point itself may feel like a bruise, it should not cause pain when applying pressure. The best time to use pressure points to induce labor is when you are already in labor and you want to strengthen the contractions. You may also want to begin using these pressure points if your water has broken and you have not yet started active labor. It is possible to induce labor using these methods if you are overdue. Sometimes, using these pressure points when labor has not yet started may also result in delayed labor. Many of them are used as relaxation techniques as well and they do not work for everyone. It is important that you ensure your body is ready to begin labor before using these acupressure points. If you start before your body is ready, you may create complications. Always check with someone trained in acupressure as most primary care physicians are not educated in acupressure techniques and methods.